Repsol Sport Centre’s 30+ year history and strong brand as a world-class training and competition facility is strengthened through our alignment with Canadian Sport for Life’s Long-Term Athlete Development pathway (LTAD 2.0). Canadian Sport for Life (CS4L) is a movement aimed at improving the quality of sport and physical activity in Canada. It links sport with recreation and health through integrating community, provincial and national programs. This integration takes place live, every day, under Repsol Sport Centre’s iconic tent. Members who are active, competitive and fit for life. Repsol Sport Centre’s dual mandate, strategic goals, vision and mission align with the CS4L movement and LTAD 2.0 pathway. LTAD 2.0 is a multi-stage training, competition and recovery pathway guiding an individual’s experience in sport and physical activity from infancy through all phases of adulthood. 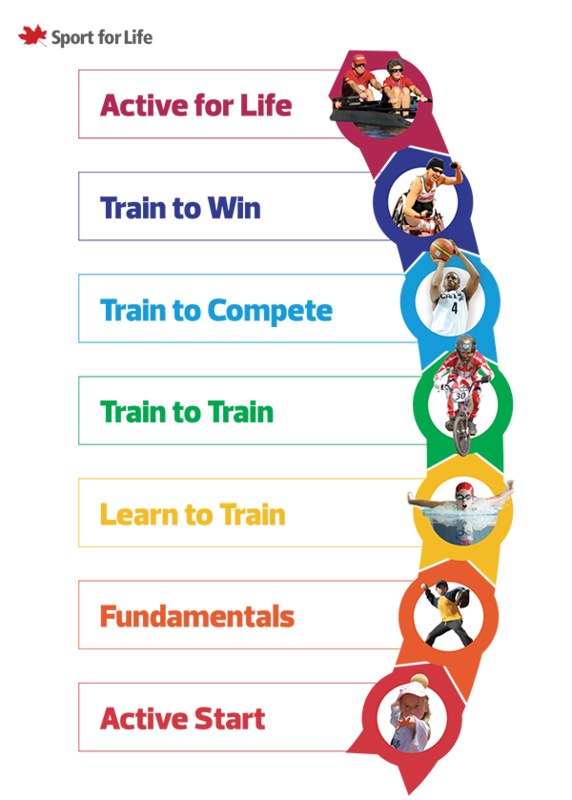 The stages of the pathway detail developmentally appropriate programs aimed at of increasing participation and optimizing performance. Structuring key aspects of our sport services including hosting meaningful competitions, maintaining our world-class facility, supporting system alignment between our sport partners and the LTAD 2.0 pathway. Inspiring every member of the Repsol Sport Centre community to continually improve through designing their individual LTAD 2.0 journey. Shaping the programs and people we develop under our tent to enable everyone in our facility to become physically literate, excellent, and active for life. Where do you see yourself on the LTAD 2.0 pathway? Movement is the first language of the child. At this stage of development fundamental movements are learned and linked together through play. Optimal development occurs when adults provide safe and unstructured access to a wide variety of colourful toys and equipment. Chronological age for both males and females is 0-6 years old. Children need to develop their fundamental movement skills at this stage and build overall movement skills across a range of environments. Skill development should be positive, structured and fun! Best practice includes encouraging a range of activity experiences that develop agility, balance and coordination. Chronological age for males is 6-9 and for females is 6-8 years old. Physical literacy continues to develop in this phase and the overarching objective is to learn overall sport skills. One of the most important skill development windows for children occurs between the ages of 9 and 12 (this phase of LTAD 2.0). At the same time, unstructured free play is crucial in this phase. Physical literacy should be one of the key objectives in every TRAIN TO TRAIN program. Chronological/developmental age for males is 9-12 and females are 8-11 at this stage. This phase and its predecessor (LEARN TO TRAIN) are the most important stages of athletic preparation on the LTAD 2.0 pathway. Core objectives at this time include building an aerobic base and applying skills and tactics to competitive situations. Developmentally appropriate and meaningful competitions should be integrated into periodized plans that include regeneration and recovery in this phase. Chronological/developmental age for males is 12-16 and females 11-15. The core objective of this LTAD 2.0 phase is to optimize the engine and learn to compete. At this stage, athletes participate in year-round, high intensity, individual-,event- and position-specific training and recovery. The specificity of purpose devoted to all aspects of individual athletes’ development in this stage is detailed and dynamic. Chronological/developmental age for Train to Compete males at this stage is 16-23 while females are 15-21 years old. Athletes who participate in this excellence-focused stage of the CS4L framework are physically, mentally and emotionally prepared to perform on demand. This is the final phase of podium pathway preparation for Canadian athletes – world class sport performances on the Olympic and Paralympic stage are delivered by TRAIN TO WIN athletes. Chronological/developmental age for males is 19 and older, for female athletes it is 18 and older. Embodies all competitive sport that functions under a set of rules and occurs outside of the excellence pathway, which is defined as Train to Train, Train to Compete and Train to Win. Canadians who enliven this part of the LTAD 2.0 pathway often compete in Masters Games and similar competitive events. FIT FOR LIFE: Includes all physical activity such as hiking, cycling, yoga, skiing and walking as well as non-organized sport such as pick-up games. This phase of the LTAD2.0 pathway is often where Canadians who have developed their physical literacy in other stages of the framework find themselves when they move away from competitive sport. Is a wide and deep component of the CS4L framework and we know that positive experiences across all other stages in the pathway are key to retaining Canadians in this expansive chapter of their physical literacy story. Canadians may enter this phase of the pathway any time after the onset of their growth spurt. The objective of Active for Life, is to provide a smooth transition from developing physical literacy to lifelong physical activity and participation in sport, or from the sport excellence stream to Competitive for Life or Fit for Life.